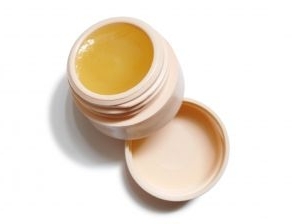 Tea tree oil salve can be used for sore muscles, scratches, small sores, and as a lip balm. Even better than that, for a small amount of effort, you can save a lot of money and make your own salve. Many health food stores carry small containers suitable for storing your salve, or to take it along with you. Want to make your own tea tree oil salve? You can make basic essential oils salves quickly and easily at home. You'll need just a few simple ingredients. So, here's some instructions to make tea tree salve. You'll need one third cup of olive oil, one third ounce of beeswax, and a teaspoon of tea tree oil. Beeswax can be ordered online or can be found off at health food stores, craft stores, and through soap or candle makers. Usually it can be found for about a dollar an ounce or less if purchased in larger amounts. Put several cups of water in your pan. Combine one cup of olive oil, and one ounce of beeswax in your mason jar. Place the jar in the pan of water and heated over medium heat until the wax melts. Stir the olive oil and beeswax thoroughly to make sure it's well mixed. Once the wax is completely melted, add one tablespoon of tea tree oil. You could do this whole operation over a double boiler, but it creates less of a mess if you do it in a mason jar. You're also ready to cool and store your salve immediately. As soon as the salve is cool to the touch, it's ready to use. You'll find it handy for relieving scratches, insect bites, bee stings, itchy spots, dry skin, and lots more.